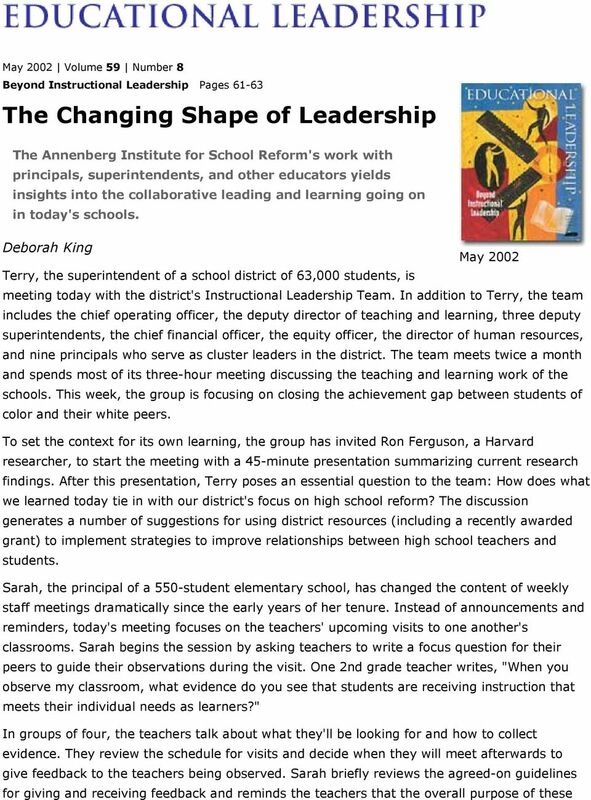 Download "The Changing Shape of Leadership"
2 visits is to improve teaching and learning by focusing on what students are doing in the classroom. After the visits, she will meet with teachers to discuss their experiences. Next month, she will share what they have learned at a meeting of principals who serve as her critical friends group. Does this kind of collaborative adult learning happen in real schools? The Annenberg Institute for School Reform is working with principals, superintendents, and district leaders across the country who are proof that it does. During the past five years, Institute staff members have collaborated with several urban school districts to help them design and implement professional development programs that support the learning and professional growth of their administrators. This collaboration features professional learning communities of principals and district leaders who meet regularly to address issues of curriculum, instruction, and assessment. This work enables us to witness firsthand how leaders are rethinking their leadership functions, roles, and practices and provides examples of how leadership for learning benefits both adults and students in schools and districts that are serious about implementing change. 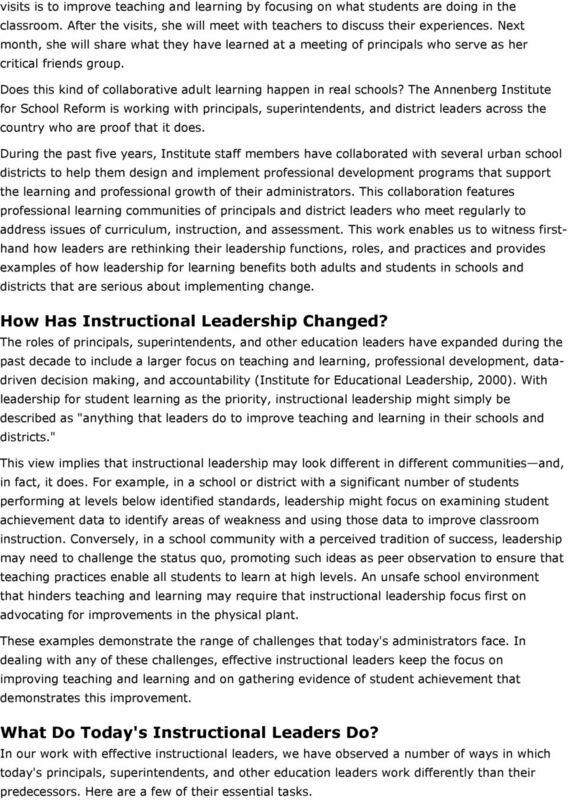 How Has Instructional Leadership Changed? The roles of principals, superintendents, and other education leaders have expanded during the past decade to include a larger focus on teaching and learning, professional development, datadriven decision making, and accountability (Institute for Educational Leadership, 2000). 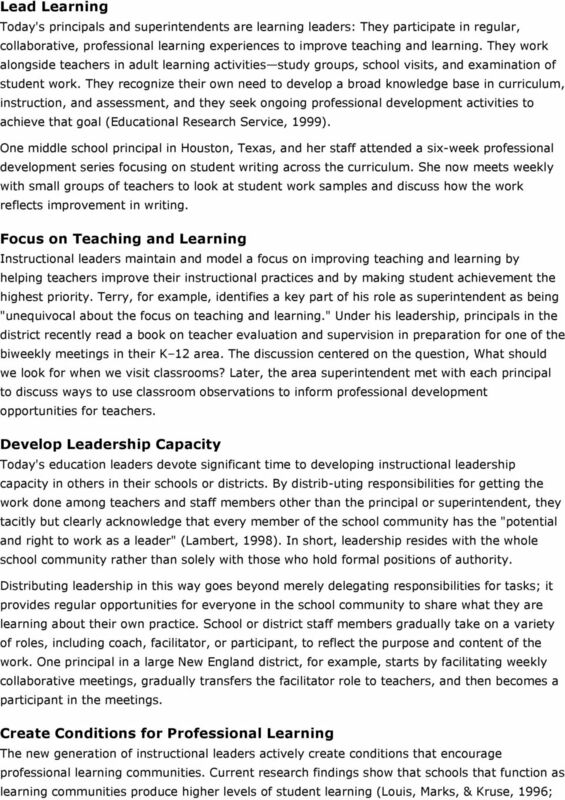 With leadership for student learning as the priority, instructional leadership might simply be described as "anything that leaders do to improve teaching and learning in their schools and districts." 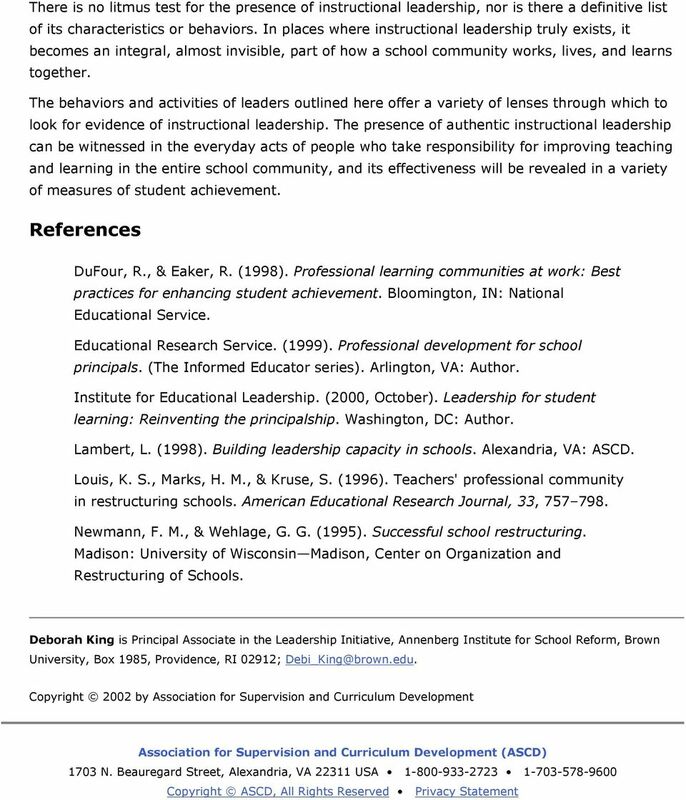 This view implies that instructional leadership may look different in different communities and, in fact, it does. For example, in a school or district with a significant number of students performing at levels below identified standards, leadership might focus on examining student achievement data to identify areas of weakness and using those data to improve classroom instruction. Conversely, in a school community with a perceived tradition of success, leadership may need to challenge the status quo, promoting such ideas as peer observation to ensure that teaching practices enable all students to learn at high levels. An unsafe school environment that hinders teaching and learning may require that instructional leadership focus first on advocating for improvements in the physical plant. These examples demonstrate the range of challenges that today's administrators face. 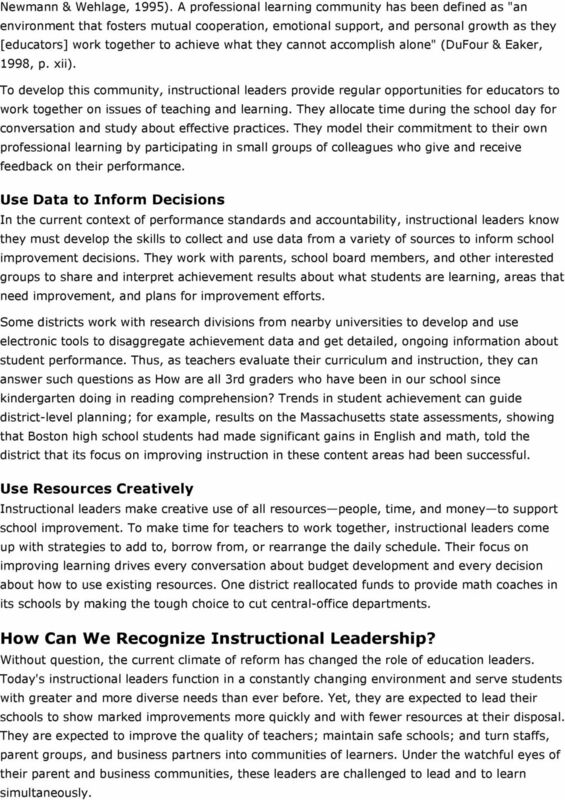 In dealing with any of these challenges, effective instructional leaders keep the focus on improving teaching and learning and on gathering evidence of student achievement that demonstrates this improvement. What Do Today's Instructional Leaders Do? In our work with effective instructional leaders, we have observed a number of ways in which today's principals, superintendents, and other education leaders work differently than their predecessors. Here are a few of their essential tasks. 4 Newmann & Wehlage, 1995). A professional learning community has been defined as "an environment that fosters mutual cooperation, emotional support, and personal growth as they [educators] work together to achieve what they cannot accomplish alone" (DuFour & Eaker, 1998, p. xii). To develop this community, instructional leaders provide regular opportunities for educators to work together on issues of teaching and learning. They allocate time during the school day for conversation and study about effective practices. They model their commitment to their own professional learning by participating in small groups of colleagues who give and receive feedback on their performance. Use Data to Inform Decisions In the current context of performance standards and accountability, instructional leaders know they must develop the skills to collect and use data from a variety of sources to inform school improvement decisions. They work with parents, school board members, and other interested groups to share and interpret achievement results about what students are learning, areas that need improvement, and plans for improvement efforts. Some districts work with research divisions from nearby universities to develop and use electronic tools to disaggregate achievement data and get detailed, ongoing information about student performance. Thus, as teachers evaluate their curriculum and instruction, they can answer such questions as How are all 3rd graders who have been in our school since kindergarten doing in reading comprehension? Trends in student achievement can guide district-level planning; for example, results on the Massachusetts state assessments, showing that Boston high school students had made significant gains in English and math, told the district that its focus on improving instruction in these content areas had been successful. Use Resources Creatively Instructional leaders make creative use of all resources people, time, and money to support school improvement. To make time for teachers to work together, instructional leaders come up with strategies to add to, borrow from, or rearrange the daily schedule. Their focus on improving learning drives every conversation about budget development and every decision about how to use existing resources. One district reallocated funds to provide math coaches in its schools by making the tough choice to cut central-office departments. How Can We Recognize Instructional Leadership? Without question, the current climate of reform has changed the role of education leaders. Today's instructional leaders function in a constantly changing environment and serve students with greater and more diverse needs than ever before. Yet, they are expected to lead their schools to show marked improvements more quickly and with fewer resources at their disposal. They are expected to improve the quality of teachers; maintain safe schools; and turn staffs, parent groups, and business partners into communities of learners. Under the watchful eyes of their parent and business communities, these leaders are challenged to lead and to learn simultaneously. What Is a Professional Learning Community? Richard DuFour To create a professional learning community, focus on learning rather than teaching, work collaboratively, and hold yourself accountable for results. In school, time is precious. There is never enough of it to educate students as well as teachers and administrators. Sharing. Secrets. Sharing the Secrets By Rebecca Good These 10 practices can help assistant principals develop their instructional leadership skills to become more effective school leaders. In school, time is precious. A Blueprint for Transforming Philadelphia s Public Schools. Safe, high-quality schools. Fiscal sustainability. Learning Environments: A 21st Century Skills Implementation Guide Produced by To succeed in college, career and life in the 21st century, students must be supported in mastering both content and skills. Teacher-led School Improvement. The Case for. Principals expanded roles and responsibilities can be shared with teacher leaders.